I've always loved growing my own herbs. Never had my own herb garden per se, just indoor pots of tarragon, parsley, marjoram, basil, and oregano. When I lived at home, my mother always had mint outside at the garden tap. Someday I hope to have an actual herb garden of my own. 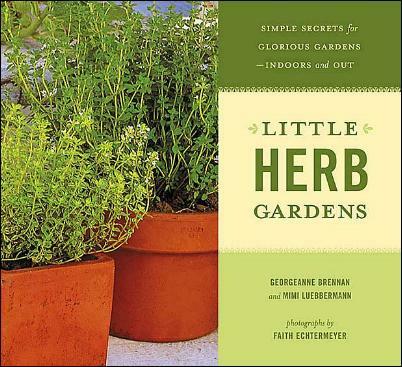 Georgeanne Brennan and Mimi Luebbermann give us extremely helpful ways to cultivate our own herbs, and they cover Potted Herbs to Grow on a Windowsill or Fire Escape; Potted Herbs to Grow on an Inside Porch; Outdoor Potted Herbs; Herbs to Grow in a Patch of Ground; Herbs for a Sense of Vast Vistas, and Fresh Herbs in the Kitchen Pantry. If you've ever walked past and inhaled the smells of an herb garden, you'll appreciate what it must be like having your own growing in or around your own place. This book offers information on soils, watering, and climate conditions, all vital if you want to have success with your herbs. Some of the herbs here include: Arugula; Cilantro; Parsley; Green Onions; Rosemary; Sorrel, and Thyme among others. There are also "recipes" for herb-infused oils and vinegars. Beautifully illustrated. You can almost smell the herbs.